ST. GEORGE — While last year was bone dry, this year is dripping wet by comparison. April 1 marked the start of a new water year, and water managers across the state are in a much happier place now than they were this time last year. Water officials characterized last year as “abysmal” in regard to minimal snowpack in the region at the time. As the year progressed Gov. Gary Herbert called on the state’s faith communities to pray for snow to counteract the “dangerously low” snowpack levels across the state. This time last year Pine Valley Mountain was barren of snow. As of April 9, snow was visible at higher elevations. The last time that happened was 2011, Thompson said. In higher elevations like Kolob, he said there is at least 34 inches of water packed within the snow. That will help refill Kolob reservoir, which was chemically treated and drained last year to kill off illegally introduced fish. 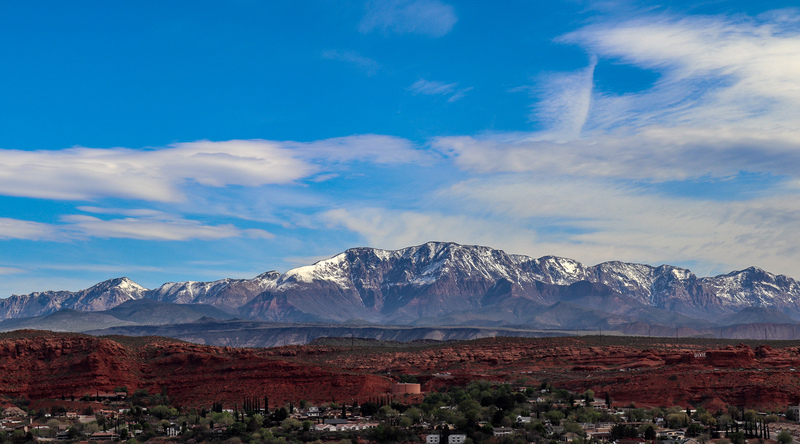 Overall, the snowpack in Utah is 140 percent above normal, according to a water supply outlook report released last week by the National Resources Conservation Service for Utah. Reservoir storage, which has been credited by water managers for getting the state through dry periods, improved 3 percent in March and is at 65 percent of capacity in Utah overall, according to the NRCS report. “Our streamflow runoff forecasts suggest that there is a very good chance that most small to medium-size reservoirs will fill this year, and we can expect substantial improvement in water storage at our larger reservoirs,” the report states. Thompson anticipates all of the county’s reservoirs will fill to capacity this year. “That’s a good place to be if you’re the water manager,” he said with a grin. 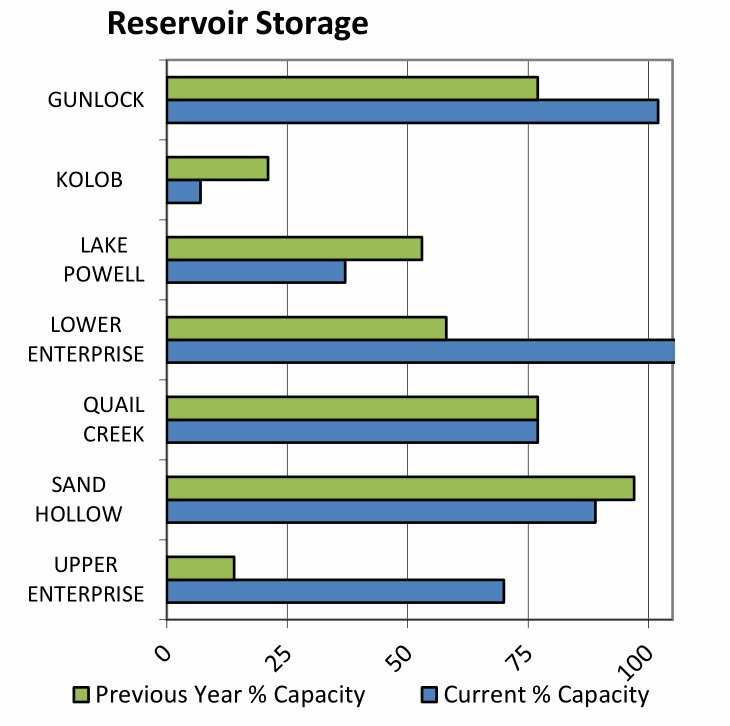 According to the NRCS report, compared to last year, Quail Creek reservoir has remained fairly consistent in its storage capacity at over 75 percent. Sand Hollow is currently between 85-90 percent where it was near 100 percent capacity last year. However, Thompson repeated his belief Sand Hollow will fill like the rest as the snowpack melts. Reservoirs that have seen the most dramatic increases in capacity this year according to the report are Upper and Lower Enterprise. The upper reservoir was a less than 20 percent last year and is now around 70 percent. The lower reservoir has increased from around 60 percent of capacity to over 100 percent. Gunlock reservoir is also just over 100 percent of capacity this year. There is a slight concern about potential flooding should warm spring rains hit the higher altitudes where snowpack remains. That can cause rapid runoff that could trigger flooding, Thompson said. If the weather remains moderate and the snow melts as usual, it will cause the Santa Clara and Virgin rivers to rise, but not to worrisome flood levels, Thompson said. 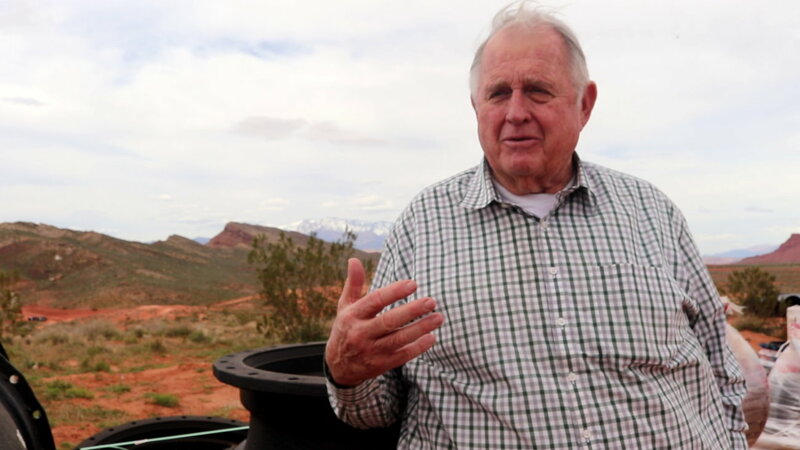 While 2019 is shaping up to be a “great” water year almost as good as 2011 and 2005, water officials aren’t ready to declare an end to Utah’s years-long drought. Utah Climate Center research climatologist Jon Meyer said he is waiting for information on spring runoff before deciding whether to crown 2018-19 as the perfect water year, according to a report by The Salt Lake Tribune.